It appears that Nature has had it with humanity’s profligate ways. 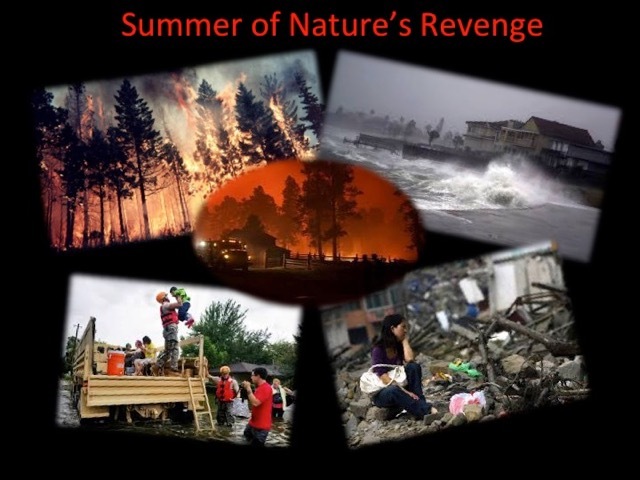 If our species refuses to live in harmony with Nature, then there will be increasingly severe consequences, as we’ve witnessed this summer, with some of the hottest temperatures and natural disasters ever recorded. Numerous recurring catastrophes around the globe that produce heavy air pollution, spillage of toxic materials into groundwater and waterways, and extraordinary floods, droughts, and earthquakes in continents other than North America. The one common perpetuator, or generator, for most of these disasters is none other than our own species. Yes, we have only ourselves to blame for most of our ills, the possible exceptions being major earthquakes and volcanic activities—except for the fact that people continue settling in disaster-prone areas, including earthquake zones, at the base of volcanoes, in tornado alleys or hurricane regions, and near waterways prone to repetitive flooding. Adding to survival and sustainability concerns, it must be noted that many material infrastructures are not designed to withstand such overpowering catastrophes. On top of all these concerns is the reality that overpopulated areas greatly multiply the harm to life and property associated with all natural disasters. For instance, if large, crowded cities like Houston (or Miami) were sparsely populated, say, at the mid-20th Century levels, which would be have been around 600,000 citizens in Houston versus the current population of around 2,500,000, the material devastation and loss of lives would be far less severe. Moreover, evacuating people to shelters and providing life-saving solutions would be far easier, safer, and less expensive to manage with small populations. Indeed, I can’t think of anything that wouldn’t function better and be more manageable with fewer people. The largely unspoken truth is there are better ways for humans to live sustainably on planet Earth. The existing neoliberal paradigm, which is based on our addiction to constant economic growth, leads to wasteful consumption, greed-oriented profiteering, reliance on fossil fuels, and depletion of limited material resources. This outmoded paradigm needs to be examined, and, hopefully, discarded—and replaced. It’s evident to many sustainability experts that a new paradigm is needed, one founded on core values that result in sustainable, humane practices. And it needs to happen fast! A balanced socio-political-economic-environmental strategy that combines bottom-up (grassroots, local and regional action) and top-down (national and global) solutions will be essential—if we are to survive and perhaps even flourish as a species. We can begin the public discussion by aggressively promoting accurate scientific information—especially within the mainstream media—about the synergistic connection of climate change and overpopulation. The future of humanity is in our hands—and tempus fugit! > The Guardian: Stop Talking Right Now About The Threat Of Climate Change. It’s Here; It’s Happening (Bill McKibben). Because we have burned so much oil and gas and coal, we have put huge clouds of CO2 and methane in the air; because the structure of those molecules traps heat the planet has warmed; because the planet has warmed we can get heavier rainfalls, stronger winds, drier forests and fields. It’s not mysterious, not in any way. It’s not a run of bad luck. It’s not Donald Trump (though he’s obviously not helping). It’s not hellfire sent to punish us. It’s physics. > Resource Insights: The Storms Are Only Going To Get Worse (Kurt Cobb). The fact that we are used to hearing about 1,000-year floods tells us that they will no longer be rare. In fact, since climate change is at the heart of these events and continues unabated, we can expect that storms practically everywhere will get worse. Instead of planning based on such long intervals, we will be faced with probabilities that are rising in unknown ways at unknown speeds. Without a coherent plan to address climate change, the world will simply lurch from one climate-induced crisis to another. > Washington Post: Four Underappreciated Ways That Climate Change Could Make Hurricanes Even Worse (Chris Mooney). Scientists are more willing to link factors like worsened storm surge flooding and hurricane rainfall to climate change. Here are some less-discussed storm attributes that could plausibly change in a warming world: 1) season length; 2) regions of formation and intensification; 3) rapid intensification; and 4) storm size. In sum, there is more than claiming hurricanes will probably be more intense, will rain more, will ride atop higher seas, but could be less numerous overall. > Yes! Magazine: 90 Companies Helped Cause The Climate Crisis—They Should Pay For It (Sarah van Gelder). What all recent climate-related disasters have in common is that they are all exactly the sort predicted by climate models—and they will get terrifyingly worse over coming years. According to a report published in early September by the journal Climatic Change, 90 companies are responsible for 42 to 50 percent of the increase in the Earth’s surface temperature and 26 to 32 percent of sea level rise. A good place to start would be requiring those who caused the climate catastrophe to pay. > Peak Prosperity: Who’s Going To Eat The Losses? (Chris Martenson). Younger generations facing an increasingly flawed future are beginning to resist, which is completely understandable. They have nothing to gain if the status quo continues, whereas the boomers have everything to lose if the status quo changes. The fallacy of thinking that we can face a major disaster, like a hurricane or war, and then not only recover, but return better than ever is a dangerous delusion to hold. > Think Progress: Stunning New Analysis Reveals Just How Unprecedented Harvey Was (Joe Romm). A Study Released Friday ” found that Harvey delivered a stunning once-in-25,000-year deluge over much of southeast Texas. Some places saw an unimaginable once-in-500,000-year deluge. Harvey stalled in place for days while maintaining much of its strength, leading to five-day rainfall totals that blew past the previous all-time record for the continental United States of 48 inches. The National Weather Service recorded an astonishing total of 51.88 inches of rain in Cedar Bayou, Texas. > MPR News-AP: Pope Blasts Climate Change Doubters, Cites Moral Duty To Act (Staff). Pope Francis has sharply criticized climate change doubters, saying history will judge those who failed to take the necessary decisions to curb heat-trapping emissions blamed for the warming of the Earth. Francis said scientists have also clearly charted what needed to be done to reverse course on global warming and said individuals and politicians had a “moral responsibility” to do their part. > Common Dreams: Study: 83% Of Tap Water Around The Globe Tested Positive For Tiny Plastic Fibers (Jessica Corbett). “Microscopic plastic fibers are flowing out of taps from New York to New Delhi,” according to a recent investigation by Orb Media, which found plastic contamination in 83 percent of drinking water samples gathered from more than a dozen countries on five continents. The U.S. had the highest levels of contamination, with 94 percent of its 33 samples testing positive for plastic fibers. > USA Today: Volkswagen, Mercedes-Benz Launch Electric Cars: ‘Anything Tesla Can Do, We Can Do Better’ (Nathan Bomey). In a rapidly intensifying competition with Tesla, General Motors, Nissan and other global auto companies, German automakers Volkswagen Group and Daimler ambitious new plans to make long-range electric vehicles could be timed just right after years of tepid industry sales for electric cars. The moves are also motivated by China’s commitment to electric cars—and rapidly falling battery prices, will quickly make electric cars as affordable as gas vehicles. > Mother Nature Network: 11 Records Hurricane Irma Has Broken (So Far) (Mary Jo DiLornardo). Irma is tied with the 1932 hurricane in Cuba as the longest time (3.25 days) spent as a Category 5 hurricane. At 11.25 days Irma became the longest-lived Atlantic hurricane since Ivan, which lasted for 10 days in 2004. With maximum sustained winds up to 185 mph, Irma is the strongest storm on record to impact the Leeward Islands, the first Category 5 hurricane to make landfall in the Bahamas since Andrew in 1992, and the first Category 5 hurricane to make landfall in Cuba since the hurricane of 1924. > Scientific American: Hurricane Irma: Florida’s Overdevelopment Has Created A Ticking Time Bomb (Annie Sneed). Due to intense population growth and overdevelopment of its low-lying coastal zones, Florida remains in a very dangerous position. Meteorologist Stephen Strader predicts it is only a matter of time before another storm devastates the Sunshine State and some of its major cities. And he adds that overdevelopment and expanding populations across the U.S. mean natural disasters now pose a greater risk to many other places, such as Houston and Oklahoma City. > Earth Justice: Hurricanes Irma And Harvey Cast Spotlight On Toxic Threats In Our Midst (Diane Carman). Our country has just witnessed two of the worst hurricanes in our history and the work of rebuilding shattered lives in Texas, Florida, and elsewhere has barely begun. Preventing toxic threats in the future and cleaning up hazardous waste should be a big part of the story. > Quartz: The 3% Of Scientific Papers That Deny Climate Change Are All Flawed (Katherine Ellen Foley). Those who assert that these papers are correct while the other 97% are wrong are holding up science where the researchers had already decided what results they sought, the authors of the review say. Good science is objective—it doesn’t care what anyone wants the answers to be. > Common Dreams: Your Worst Fears About Fox News Are Confirmed By New Study (Julia Conley). The newest research confirms what many critics already suspected about Fox News: that it’s pushed conservative ideals and Republican agendas since its beginning, serving as a tool used by the GOP establishment to shift viewers to the right—and even swing elections. > CNS News: It’s Official: Debt Tops $20 Trillion For First Time (Terence P. Jeffrey). The national debt is now $20.1 trillion, larger than the size of the entire US economy. Social Security, Medicare, Military, and, interest on the debt account for nearly 90% of all US government spending, while the national debt is growing much faster than the economy. History is full of examples of once-dominant civilizations crumbling under the weight of their rapidly expanding debt. > Star Tribune: Sick Maple Trees ‘Becoming Epidemic’ In Minnesota (Kim Palmer). Many of the maple trees in distress are suffering from root girdling, a condition in which roots grow around another root or the trunk, eventually strangling the tree. Maples are prone to root girdling because they have fast-growing, shallow root systems. The condition is becoming more common because most trees sold at nurseries and garden centers are now grown in containers (as opposed to a field), resulting in roots that have already begun to spiral before the tree is even purchased and planted. > Yes! Magazine: How To Feed Ourselves In A Time Of Climate Crisis (Ray Patel, Matsue Loeffelholz). Here are 13 of the best ideas for a just and sustainable food system, from saving seeds to curbing food waste: 1) indigenous land sovereignty: 2) agro-ecology; 3) carbon sequestration; 4) resilient poly-culture; 5) open-source seeds; 6) genetic diversity; 7) better pay; 8) valuing traditional knowledge and skills; 9) regional food hubs; 10) accessibility, affordability; 11) eating together; 12) eating plants; and 13) wasting nothing. > Medium: We’ll Always Have The Sun: Solar Energy And The Future Of Humankind (Ugo Bardi). Asking if renewable energy can replace fossil energy implies that the only possible civilization is our civilization as it is nowadays, including SUVs parked on every driveway and vacation trips to Hawaii by plane for everyone. But keeping these incredibly expensive wastes of energy will obviously be impossible in the future, even imagining that we were able to stay with fossil fuels for another century or even more. > Better Humans: Information Sickness: How It Hurts Us And How To Escape (Charles Chu). We humans are not built for today’s information-ridden, fast-paced world. There was no Instagram or cryptocurrency to be found out on the African savanna. What does all this information do to us? In exchange for what we have gained, what is it that we have lost? Some solutions: 1) fast, away from electronic media; 2) take long walks; 3) meditate; 4) start a journal; 5) choose high-quality resources; 6) limit yourself; and 7) read old historical sources. > Jake’s Junk Removal: We Need To Do More Than Just Recycle. Let’s Start Here (John Hawthorne). We all know that caring for the environment is essential. This is our home, and if we fail to care for our home, our children, our grandchildren, and we will suffer the consequences. Clearly, action must be taken. But what specific steps can we take to cut down on our garbage output? Here are 11 steps to take. > Transition Twin Cities: Groups And Activities: Transition ASAP • Transition Longfellow • Corcoran Grows • Transition North Suburbs • Transition West St. Paul/West Side • Transition NE; For resources and connections Contact Leslie MacKenzie.